See the Great Barrier Reef! After Wednesday’s workshops, the GIS/LIS Consortium will host a registration and welcome reception at the Science Museum of Minnesota. Starting at 4:30 p.m., there will be food and a cash bar available until the 7:00 p.m. showing of the Coral Reef Adventure in the Omnitheater. Explore the Great Barrier Reef, Fiji, Tahiti, the mysterious depths of the Rangiroa atoll and see the beauty, magic, and value of coral reefs in the world community. Space is limited, so please register for this event early to reserve your seat. There is no cost to registered conference attendees for this reception and movie; tickets may be purchased for guests of registered conference attendees at a cost of $15 each. Please join us for a bootlegger gathering in the Ramsey County Room at the historic Landmark Center, just steps away from the Touchstone Energy® Place, RiverCentre. 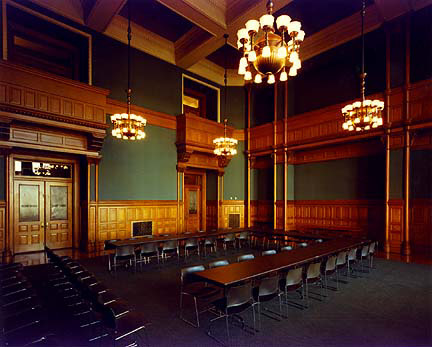 From 1902 through the 1960s, Landmark Center served as the Federal Courts Building for the Upper Midwest, and the Ramsey County Room was the site of many infamous gangster trials during the 1930s. The GIS/LIS Consortium has reserved this room for the evening of Thursday, October 9, when we will hold our own ‘trial’: the annual beer tasting event, sponsored by the Boreal Brewers Club of Bemidji. Home brewers are encouraged to bring beer or other fermented beverages to share—all brought-in beverages must be poured by a designated GIS/LIS tasting host. A cash bar will also be available, offering additional beer, wine, and pop. Light hors d’oeuvres will be included with the $15 admission. This year's tasting is sponsored by Summit Brewing of St. Paul, and Lake Superior Brewing of Duluth. The Ramsey County Room is reserved for us from 7:30-10:30 p.m. Space for this event is limited, so get your tickets early! All proceeds beyond the cost of the event will be donated to the GIS/LIS Consortium Scholarship Fund. You must be at least 21 years of age to attend this event, and identification will be checked at the door. Hope to see you there! Registration: Please complete this registration form and mail or fax to the address or number indicated. Full payment or purchase order must accompany your registration form and be postmarked by October 1 to be pre-registered. Registrations received after October 1 will be considered on-site registrations; payment or purchase order must be presented at the time of registration. Refunds: With written cancellation notice, received by September 12, you will receive a full refund, less a $35 administrative charge. Cancellations after September 12 are non-refundable. Notices of cancellation must be faxed to the Minnesota GIS/LIS office at 651-290-6279. No shows will not receive a refund.